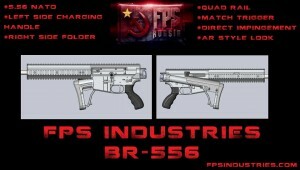 FPS Russia posted a teaser of a rifle he and his crew, whomever they may be, are planning to put into production. Congrats to them and the best of luck in this humming AR market. The grip uses a more FAL like angle whereas companies like Magpul, Bravo, Umbrella Corporation, and Ergo have recently been aiming for the opposite more subtle angle, for CQB use. 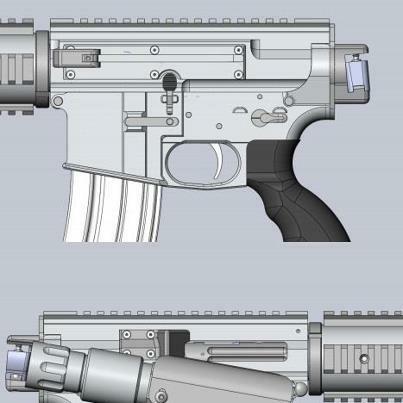 It appears to feature an ASA (American Spirit Arms) inspired side-cocking upper receiver. This design utilizes a folding charging handle much like the FN L1A1 (Commonwealth variant of the FAL). Like the ZM Weapons (sold first as a YHM and later as a ParaOrdnance) piston driven AR, it uses a shortened bolt-carrier and receiver internal recoil springs. This allows for a side folding stock which is a nice feature for those trying not to be obvious when transporting arms. The upper receiver appears to include a stock-catch integrated on the brass-deflector, in order to lock in the folded position. This is an assumption on my part, maybe it’s just airsoft. Keith Ratliff, the manager of FPS Russia and owner of ..
As some of you have heard, FPS Russia's new project .. The ZM LR300 didn’t use a conventional piston. It merely had a really short gas tube matched to a really long carrier key that doubled as a guide for the recoil spring. The gas was still vented into the carrier like a conventional AR-15. Thanks for the added information, I was not aware.